Community members in the northeast corner of campus will see more ubiquitous construction fences in the near future. The UBC Board of Governors has given its first round of approval to the development of Brock Commons Phase 2 and Pacific Commons, which was temporarily called the Walter Gage Infill Site. Because they are commons spaces, these developments will add 1,600 new student beds and create new mixed-use spaces for services, studying and recreation. “[We’re] not just building an independent private residence, we’re building commons that allow for the entire community to use services at the ground plane and to make connections across buildings,” said interim VP Students Andrew Parr. Following the 2017 opening of the 404-bed Brock Commons Phase 1 — also known as the Tallwood House — Brock Commons Phase 2 will add approximately 600 new beds in the form of mostly four-bed quads and studios for year-round students. The project will also house arts academic advising, experiential learning suites for the Allard School of Law, an integrated Student Wellness centre and multi-faith spaces, among others. “We actually had a vision contained within the vice-president’s portfolio to create a precinct of student services to start at the north end of Brock Commons, and work all the way south and to the UBC Life Building and into the AMS Nest,” Parr said. Because of the inclusion of these services, the project will receive $15.06 million from the faculty of arts, $1.73 million from the Allard School of Law and $37.08 from the central university budget. The majority of the funding — or $109.28 million — will still come from Student Housing and Hospitality Services, bringing the project’s total cost to $163.2 million. The construction for Brock Commons Phase 2 is expected to start in March 2020 and be completed by September 2022. 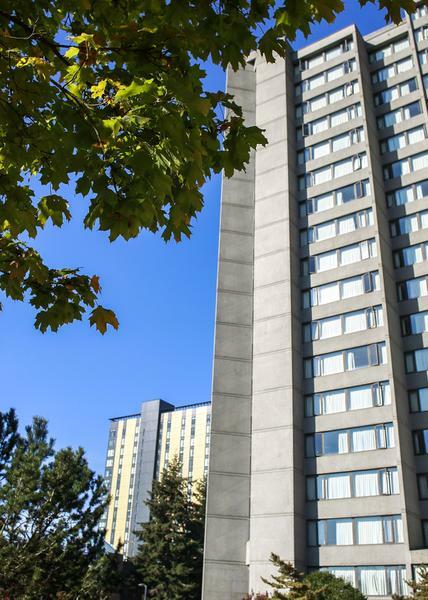 The Gage Towers area will also be receiving a make-over with Pacific Commons, which is to be constructed on top of the space currently occupied by student parking. The project will add 1,000 new beds for winter session students. Parr cited Totem Park as a model for Pacific Commons. Along with services more oriented toward residential life, there will be a common use lobby equipped with various amenities for the public. There will also be an underground parking with 240 parking spaces to replace the spots that were lost to the project’s development, but he also acknowledged that the administration has a “goal of reducing car use” and promoting alternative transportation. “I think the other important message … is UBC is striving for a reduction in the amount of vehicle traffic coming to campus and hopefully the SkyTrain line will help that,” Parr said. During the June Board meeting, UBC Associate VP of Community and Campus Planning Michael White added that the university is planning for bus lanes south of University Boulevard. When asked if the project could be larger, White said UBC also has to consider concerns about densification from community groups like University Endowment Lands (UEL) residents. When asked about this, Lindsay Byers, a public affairs officer at the ministry of municipal affairs and housing, only said that “UBC is consulting with UEL residents” as the project continues. According to the Board submission, the university is leaning toward building mainly six-storey towers. The option also includes a 16-storey tower along Wesbrook Mall and a 12-storey tower along Student Union Boulevard, but there would also be “further exploration” about their height. The construction of Pacific Commons is scheduled to start in October 2019 and finish by July 2021. The funding for its expected capital cost of $153.1 million will mostly come from internal borrowing. At the same time, there is also discussion about potentially financing parts of these projects through the creation of a government-business enterprise (GBE), depending on the timing of its development. As a separate trust with the university as its beneficiary, it would let UBC borrow without a provincial cap, allowing it to “build quickly and at lower cost,” according to Parr. UBC is currently working with the Canadian Revenue Agency and the provincial government to create a GBE — a project that is amongst the top of Parr’s priorities as interim VP Students. With these developments, Parr believes that UBC is bringing forward “a pretty aggressive growth plan” for student housing.